$15.623 million on 2605 screens. When is a Disney direct-to-video (DTV) film not a DTV film? When it comes out in theaters - duh! Indeed, the fact that it played on movie screens in February 2002 means that one cannot regard Return to Never Land as a DTV offering, but otherwise, I find little to differentiate it from the studio’s other non-theatrical releases. Actually, I suppose that’s not totally true, as Return displays moderately higher production values than we see in Disney’s DTV work. Unfortunately, the improved animation doesn’t translate into other areas. Return provides a generally bland and forgettable flick. 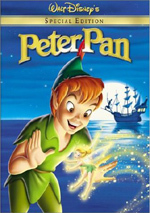 Set in London during the Nazi air raids, Return follows Peter Pan’s Wendy (Kath Soucie). All grown up, she now has a family of her own. Along with husband Edward (Roger Rees), Wendy lives with daughter Jane (Harriet Owen) and son Danny (Andrew McDonough). Initially, Jane delights to her mother’s stories of Peter, Captain Hook, and the rest, but as war encroaches and her responsibilities increase, she feels her childhood cut short and she actively attempts to make herself more of an adult. As the authorities plan to evacuate all the kids from London, Jane’s life takes a turn for the weird as Captain Hook (Corey Burton) comes a-calling. He mistakes Jane for Wendy, kidnaps her, and heads back to Never Land. There he quickly discovers his mistake and Peter (Blayne Weaver) rescues her. He also finds out that she’s not his old pal Wendy, and the pair quickly separate when Jane totally rejects the entire Never Land culture. She feels she must return to her responsibilities as soon as possible, so she contrives to sail back to London. 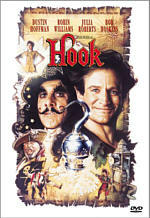 Of course, one can’t actually get from Never Land to England by boat, so the conniving Hook strikes a deal to help Jane. He pretends that he also wants to flee Never Land, and he agrees to fly Jane home if she’ll find the treasure Peter took from him. He convinces her that Peter doesn’t need it anyway, so Jane doesn’t see anything wrong with her assistance, especially since Hook promises not to harm a hair on Pan’s head. Jane’s not too bright, is she? Nonetheless, Peter needs her. When they last argued, she declared that she doesn’t believe in fairies, and that starts Tinkerbell on a slow path to death. Peter must get Jane to aver a belief in Tink’s kind or the little sparkler will expire. Eventually, he gets Jane to embrace his principles and she enjoys her earlier dream as she becomes the first “Lost Girl”. Of course, matters take a turn for the worse when Peter discovers Jane’s deal with Hook. From there, she has to redeem herself, save Tink, and make sure everything works out well in the end. Since this is a Disney movie, it shouldn’t come as any surprise that things do work out well in the end. With Disney’s flicks, the fun comes from the journey, not the final destination itself. Unfortunately, as with so many of their DTV films, Return provides a pretty dull and predictable trip. On the positive side, the animation does seem stronger than with Disney’s DTV flicks. As I understand it, Return began life destined for the DTV shelves, but as also occurred with Toy Story 2, the project eventually received an upgrade to full to theatrical status. How much that affected the quality of the visuals I don’t know, but Return definitely improves upon the usually stiff and crude animation seen in most DTV pieces. The art looks somewhat bland and generic, but it comes across as reasonably lush and lively, at least compared to the average DTV flick. While decent, however, the animation doesn’t match up to the average Disney theatrical release, and not much about the rest of the film compares favorably with most of the studio’s big screen offerings. As a rule, Disney’s DTV sequels take the original plot and invert it slightly. For example, in Pocahontas, the English come to America and confront Indian culture. In Pocahontas II, on the other hand, some Indians head to Britain and encounter their civilization. The basic plot and much of the action remains similar, but the story provides a minor twist. Make that a very minor twist, really. In the first flick, the adults - mainly represented by Wendy’s dad - tried to force the kids to grow up too soon, whereas in Return, Jane puts all the pressure on herself. The same basic theme remains, but the powers at work vary. In a nod to 21st century sensibilities, Return makes Jane more active than Wendy ever was. The latter did little more than act as a surrogate mother to the others, but Jane presents a more forceful presence. Indeed, the story requires her to rescue Peter, which seems like a nice little “girl power” touch. Otherwise, unfortunately, Return to Never Land feels like very familiar territory. As with most Disney sequels, it doesn’t provide an unpleasant experience. It offers decent production values, and the voice talent provides reasonable facsimiles of the original actors. Unfortunately, the project remains incessantly bland and lacks much reason to exist other than as product. 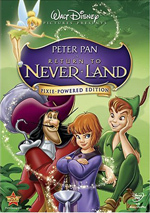 Return to Never Land appears in an aspect ratio of approximately 1.66:1 on this single-sided, dual-layered DVD; the image has been enhanced for 16X9 televisions. Though much of the transfer looked good, too many concerns popped up for my liking. Most of these stemmed from sharpness. While most shots showed good clarity and accuracy, the image turned vaguely soft at times. These instances created distractions and seemed odd. Jagged edges and moiré effects never caused any problems, and I detected no signs of edge enhancement. As for print flaws, I witnessed none. The image appeared fresh and clean at all times. 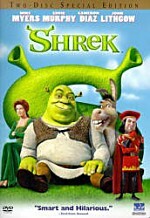 As with many Disney animated films, Return offered a vivid and lively palette, which the DVD replicated nicely. The colors consistently looked bright and vibrant, and they often seemed to pop off the screen. The hues appeared lush and tight, and they displayed no problems related to bleeding, noise, or other concerns. Black levels seemed deep and dense, but shadows were inconsistent. Some low-light shots demonstrated moderately thick tones. I felt the image was good enough for a “B-”, but it really should’ve been an “A” if it hadn’t suffered from the occasional softness and shadow issues. I thought the Dolby Digital 5.1 soundtrack of Return to Never Land was more satisfying. The film enjoyed a number of action sequences, and those allowed the mix to come to life. Music demonstrated clean and distinct stereo imaging, and effects presented a nicely vivid and lively affair. The movie offered a lot of scenes that took advantage of all five channels and these came across as effective and realistic. Hook’s aerial getaway presented a fairly vibrant sequence, and various elements moved cleanly among the speakers and also blended together well. Cannon fire flew cleanly from rear to front, and the surrounds gave us a lot of useful information. Audio quality also seemed solid. Dialogue appeared distinct and natural, with no issues related to edginess or intelligibility. Music sounded bright and clear, with crisp highs and rich low-end response. Effects also came across as accurate and detailed. When appropriate, the mix presented fine bass information; for example, the bombing sequences early in the film used the LFE channel to good effect but never became inappropriately overwhelming. Overall, I really liked the simple but compelling soundtrack of Return. How did the picture and sound of this 2007 “Pixie-Powered Edition” compare to those of the original 2002 DVD? Both displayed similar audio, but the old disc provided noticeably superior visuals. The 2002 version appeared significantly sharper, and it also presented somewhat clearer shadow detail as well. It was the greater definition that was the most notable, though, as this disc’s mildly soft shots seemed tight and firm in the 2002 release. It’s a substantial improvement on this one in terms of picture. If you expect a lot of new extras on this “Pixie-Powered Edition”, you’ll encounter disappointment. A new game called Tinkerbell’s Challenge: Quest for the Light. It requires you to complete a series of mini-games to restore Tink’s light. These are all pretty easy, but the way the game’s organized makes it take forever. I wanted to complete it to see if anything happened at the end, but I couldn’t take it anymore. The slow interface meant I needed about 20 minutes to get through three challenges, and then the game took back two of my cards when I hit the “Hook” icons. Bleh – life’s too short! Annoyingly slow game play and interface aside, I will acknowledge this game is better than most of its ilk. On the old Return DVD, we got stuck with a pointless guessing game. At least this one rewards actual skill. Disney Fairy Moments provides a four-minute and 36-second compilation. It shows some short adventures with a few of Tinkerbell’s fairy buddies. Consider it to be a glorified advertisement, because that’s what it is. A feature also found on the prior DVD, we get Lost Treasures: Deleted Scenes. After a 53-second introduction from producer Chris Chase and executive in charge of production Sharon Morrill, we get two snippets: “Where Jane and Hook Meet for the First Time” (2:04) and “Gift for Tink” (1:46). Both start and end with remarks from Morrill and Chase to give us additional info about the clips. The scenes appear in rough form, whether from storyboards to sketchy pencil animation to a little finished work. Neither segment seems very interesting, but it’s still cool to get these pieces. When you start the DVD, you’ll find the usual complement of advertisements. Here we get promos for WALL-E, High School Musical 2, Disney Movie Rewards, and Tinkerbell. These also appear in the Sneak Peeks domain along with clips for 101 Dalmatians, Disney Fairies, Cinderella 2, SnowBuddies, Wish Gone Amiss, My Friends Tigger and Pooh and The Aristocats. Oddly, this new edition of Return drops elements from its predecessor. We lose a music video, a “Read-Along Storybook” and the “Rescue the Lost Boys Adventure Game”. None of these seemed memorable, but I still don’t think the DVD should cut them. As one of Disney’s many sequels, Return to Never Land fares better than most of its siblings. However, that definitely falls into the category of “faint praise”, as the movie seems flat and generic for the most part. It improves on the studio’s direct-to-video enterprises but doesn’t provide anything to make it substantially entertaining. The DVD features decent but erratic picture, good sound quality, and a skimpy roster of extras. This is a forgettable disc for a bland movie. Is there any reason for fans who own the original 2002 Return DVD pursue this one? Nope. In fact, if you don’t have that one and you want to own Return, I’d dig up a copy of the earlier release. Nothing here improves on its predecessor, and the 2002 disc offered significantly stronger picture quality. This 2007 edition is a flawed disappointment.